COLOURS: size 2-3 years: pink, mini mouse, purple, turquoise, white, grey and royal blue and in size 3-4 years: royal blue, pink, purple melange, white, grey, royal blue, mini-mouse and turquoise in stock. 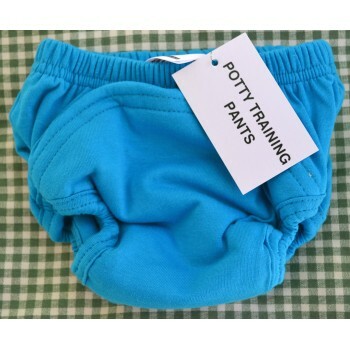 Description: Toddler potty training pants are useful in assisting toddlers to learn bladder control (by experiencing the sensation of feeling wet). 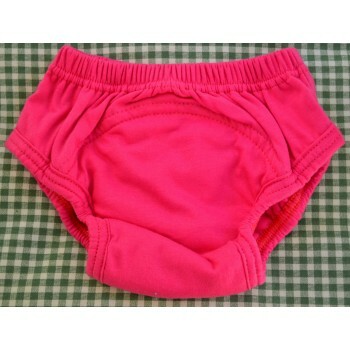 They do not replace a nappy in absorbency but are useful in preventing “little accidents”. This is especially useful during play school hours or when out and about. Big Boy or Girl! Bridging the gap from nappy to pants: The trainers pull up and down and look like ordinary underwear but with an absorbent saddle made from our bamboo toweling plus a breathable waterproof layer between 2 layers of soft cotton fabric. 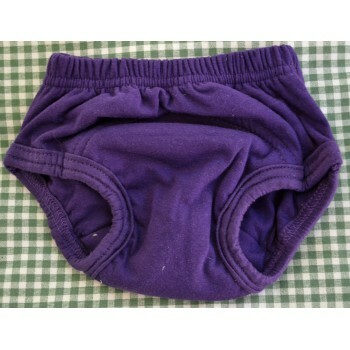 User Tip: You can either use the potty training pants as they are without a liner or if you prefer, use our fleece nappy liner of bio liner inside. Line the inside of a potty to easily clean up the mess! 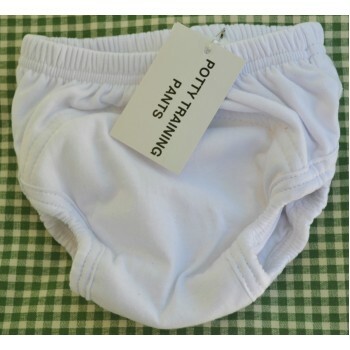 Another option is to add a bamboo insert (cloth nappy page) to add absorbency is used at night. Washing instructions: Cool or warm wash in a washing machine or by hand. Line dry only to preserve the waterproof saddle. How do I potty train my toddler? Is our big boy or girl ready? This challenging question is raised by parents around the world and what parent doesn’t want to get their child out of nappies! On average children start potty training between the ages of 2 to 3 years. Once you have gone through our signs of readiness there really is only one way to find out – give it your best go. 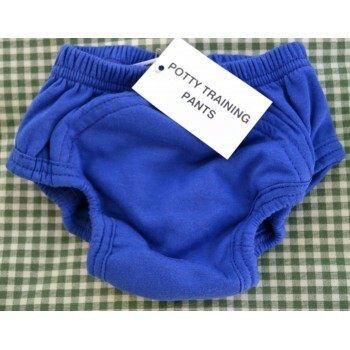 Equipment: sturdy potty or an inner seat to fit over your toilet, block to stand on to reach the toilet, bright and fun cloth potty training pants (such as Mother Nature Potty training pants) which have an absorbent saddle, bed mattress protector (such as Mother Nature’s breathable version), rewards chart . Introduce them to the toilet or potty. Let them learn by imitation by watching you spend a penny. Give them a plausible explanation as to why they must use the toilet and explain the reward system if using this system. Don’t be too pushy or angry as this will only aggravate their fear or stubbornness. Inform the playschool or carers that potty training has begun. Start off with day training by sitting them on the toilet for a few minutes at a time and then progress to night time. - Create a happy toilet story: An example is that the “yuk-yuk” goes to the sea to feed the fish when it is flushed and then say good bye. - Remember it’s not mission impossible so hang in there folks! 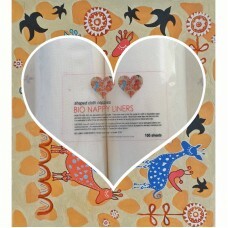 - Messy Potty Tip: Use Mother Nature’s biodegradable & flushable liners to line the bottom of the potty. After use, flush them down the toilet! No need to deal with a messy, dirty potty! - Take them to the toilet before their bedtime as well as your bedtime. Perhaps set alarm for midnight to take them again. And ensure they go to the toilet as soon as they wake up. We hope these tips are useful in successfully navigating your child out of nappies; on their path towards an independent and happy, wholesome life! ECO FRIENDLY! LOCALLY MADE! 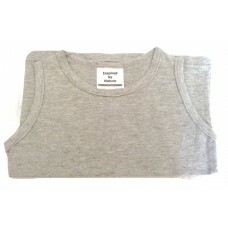 MOTHER NATURE COTTON VEST Our toddler sleeveless vests are made fr..